In the early 00’s the DC Department of Corrections closed their Lorton detention facility in Northern Virginia and returned the property, which included 4000 acres of hilly dairy farm land, to Fairfax County to redeploy for public use. The county wisely decided to take full advantage of this opportunity to build a high school, an equestrian park, a museum, an athletic complex, an arts center, and a high-end municipal golf course. 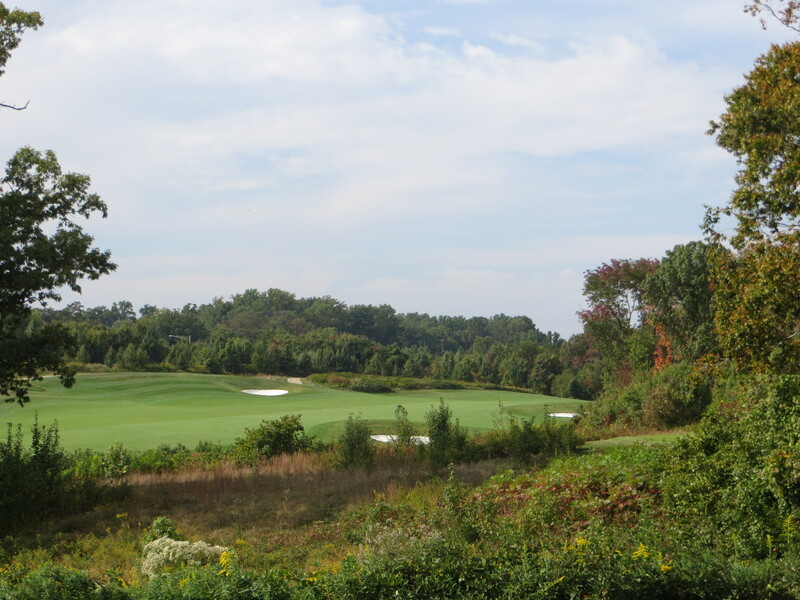 With close to 300 acres at his disposal Bill Love, an accomplished designer with an environmentally sensitive approach to course design, was asked to oversee the project and he put together what has turned out to be one of the real gems in the Washington Metro area. The juxtaposition of the property’s former use to it’s current use is intriguing. The golf course he created has stunning aesthetic beauty combined with challenging strategic design and will provide you with an afternoon of sheer golf delight. Standing on many of the tees you cannot help but stop to appreciate how the holes gently follow the natural flow of the land bringing your attention the sheer beauty of nature’s features therein. This would be a particularly inspiring experience in October with a little leaf color and a slight chill in the air. October fall colors are already adding flavor to the driving area on #9. The course is built to the top specifications featuring generous bent grass rolling fairways in impeccable condition, over 100 bunkers in places that make you think and think again, rough that will take control out of your hand on recoveries, and firm and fast greens with plenty of interesting contours to consider. 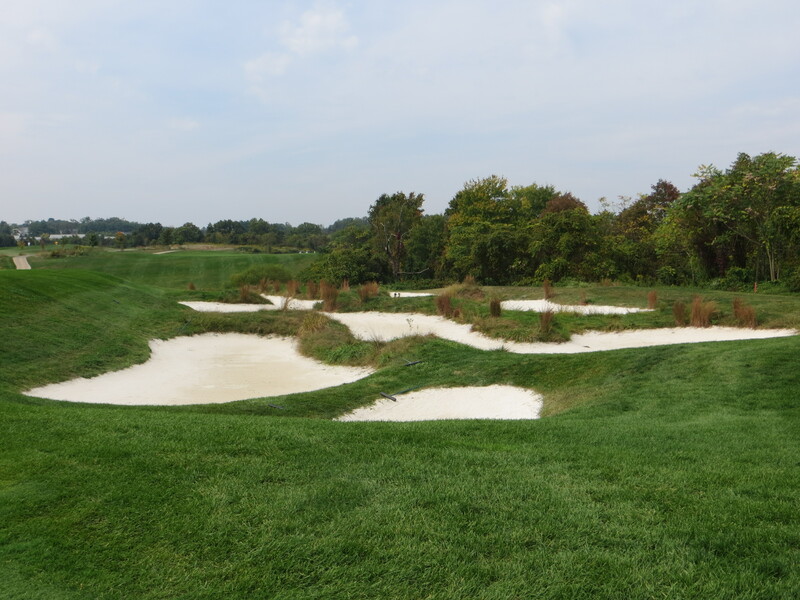 Just one nest of sand madness you must avoid in your path to the #5 green. On many holes you just have to scratch your chin and ponder the possibilities before you decide how you are going to play effectively. The county has committed serious budget money to keep this in top flight condition so the consistency of this experience is gratifying. 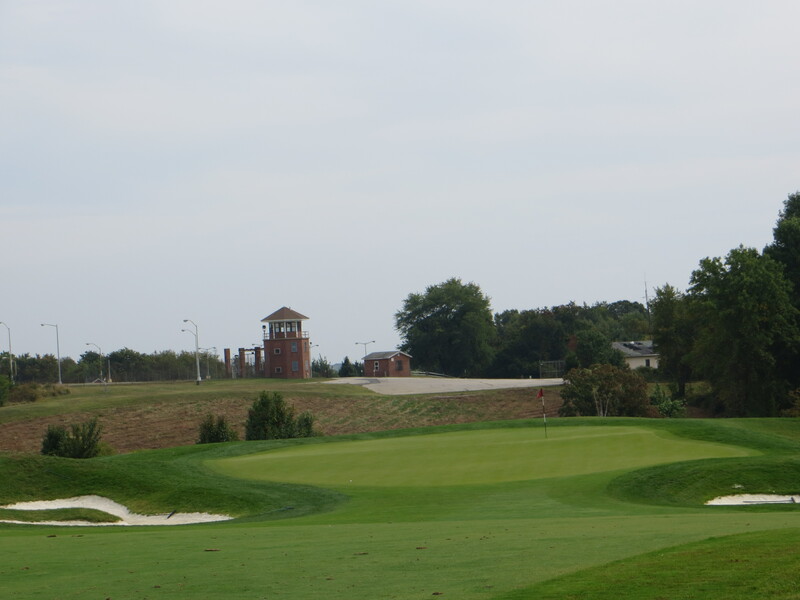 Golfweek Magazine recently put this course as #13 in their list of top municipal courses in the country. The top 15 on that list include Bethpage Black, Chambers Bay, Torrey Pines, TPC Scottsdale, and Harding Park. Pretty heady company for our local muni, huh? 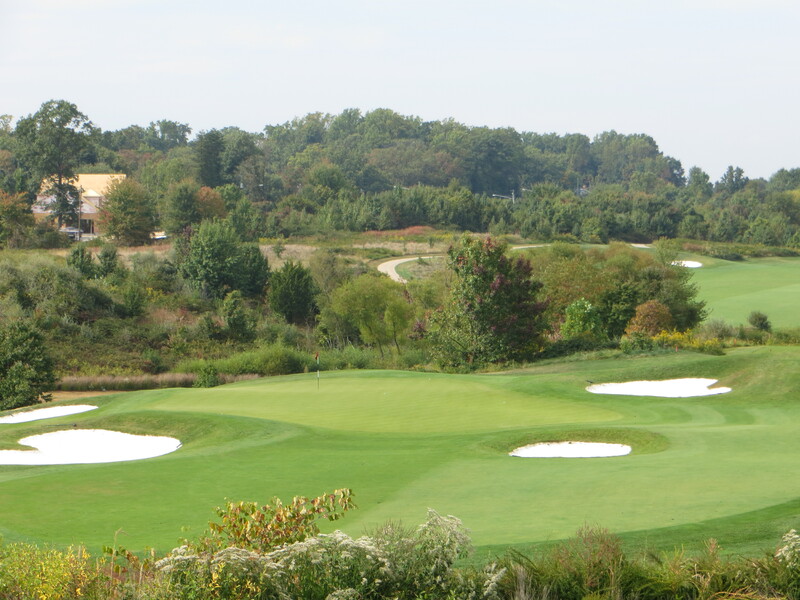 Based on this pedigree the USGA held their 2013 Public Links Championships at Laurel Hill. The uphill climb on the long 439 yard 3rd has plenty of other obstacles to consider. What I like the most about what Love has done is the variety in the types of holes he presents. The par 71 is not because of only 3 par fives-it is because of 5 par threes and these are some of the most interesting visuals of the day. 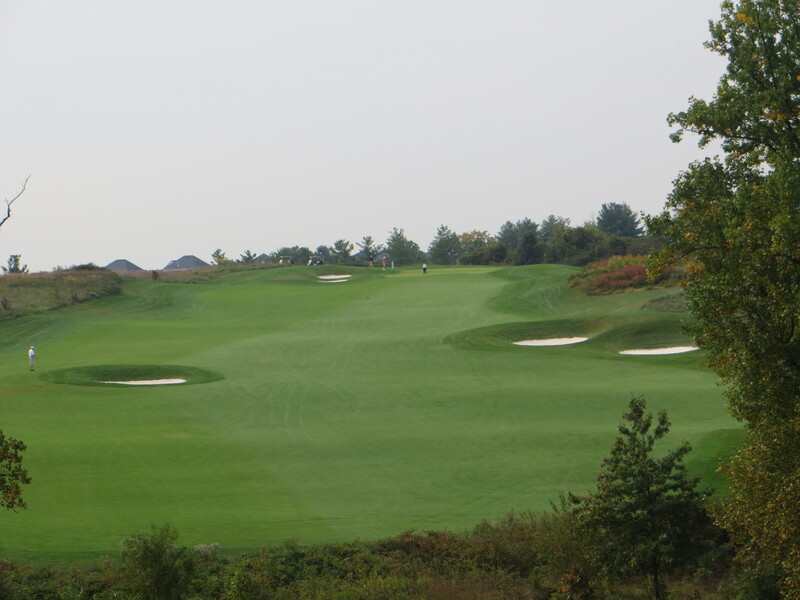 You have monster par 4s that are 425 to 450 yards and uphill to boot. You have reachable Par 5s under 500 yards with major decision making parameters. Two par threes under 150 and three par threes between 180 and 210. 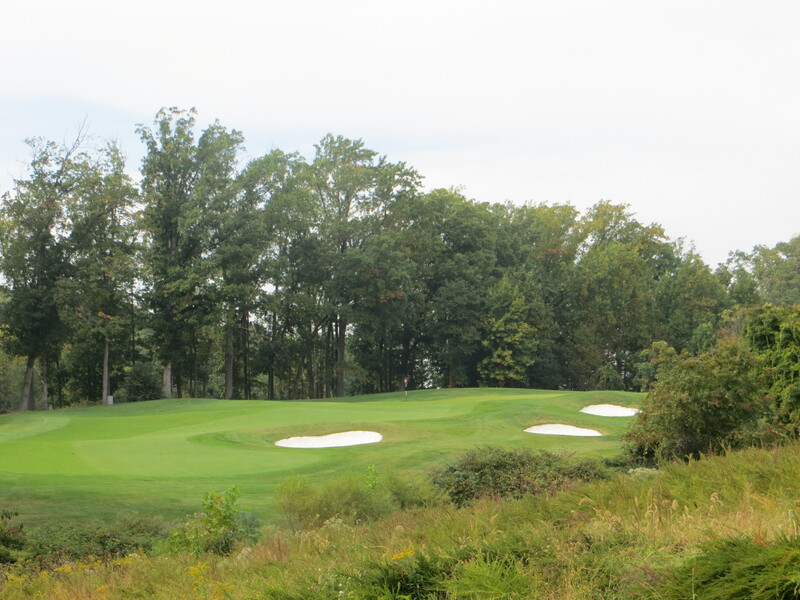 #14 is 212 yards and a club and half uphill with a three tier green to boot. There are steep uphill approaches, dramatic two-club less downhill shots, forced carries over environmental areas, and just some of those approaches where you have to slip it between the this bad thing and that. Every club in your bag will be dirty when you are done-the variety of shots you are going to be asked to hit will run the full gamut. 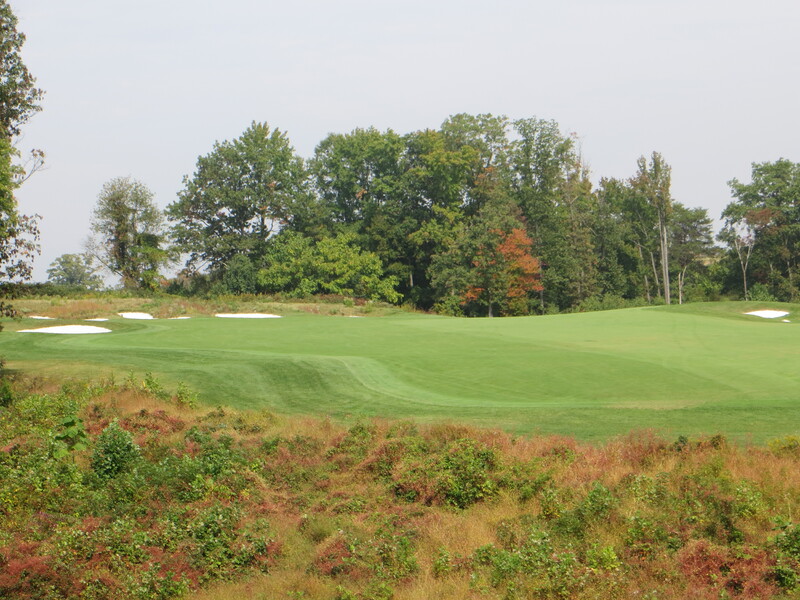 There is a natural flow to the design as you see off the tee box on the long par 4 17th. In general the driving areas are wide, but the preferred areas are always cordoned by bunkers or bordering angular topographies. On a number of the doglegs it is nests of bunkers that are your no-no not trees but trees do frame many of the landing areas and generally define the line of the holes. 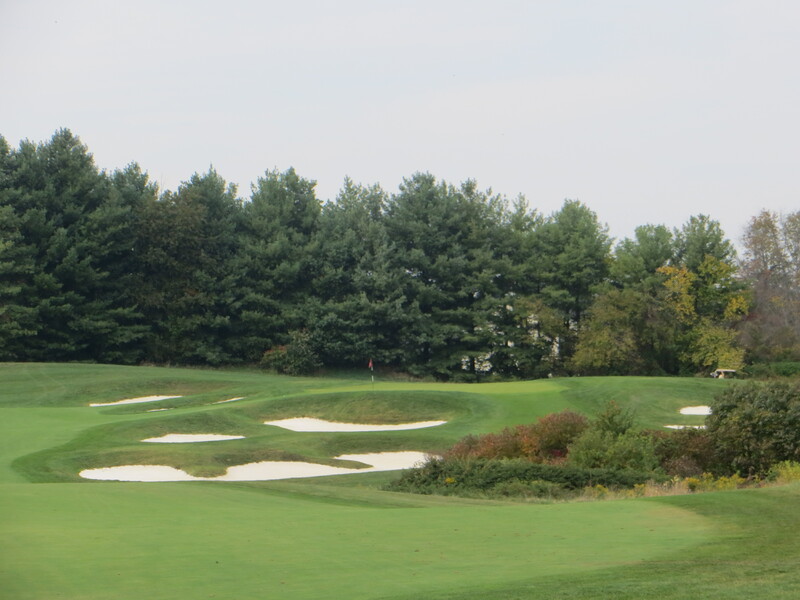 The short par 4 7th tempts the bomber but the Jack-O-Lantern bunkering will spook them. The greenside bunkering is very imaginative-often nested to one side to force you to work the ball into a green set on the diagonal line of the green. The greens themselves have lots of segmentation and tiering so you have to be careful to recognize where the pin is located and where the prevailing slope goes to keep your ball under the hole. There is not much overt water in play but there are some moist ditches and adjacent environmental areas that can lead to double bogies. Both nines end with a short par five that has real visual and strategic interest. This gives you a chance for redemption or damnation at the end of each side. The postcard 16th has alternate tees to change the challenge but not the pleasure of the view. The entire facility is done to high standard. The clubhouse is small but well appointed and functional. The grass driving range is very roomy and has the same bent grass the course. The pitching and putting areas have much of the course feature so you can practice the things you will be called on to play during your round. For a municipal fee course price you are really getting a high-end golf product. This is a must play and needs to be on your short list.